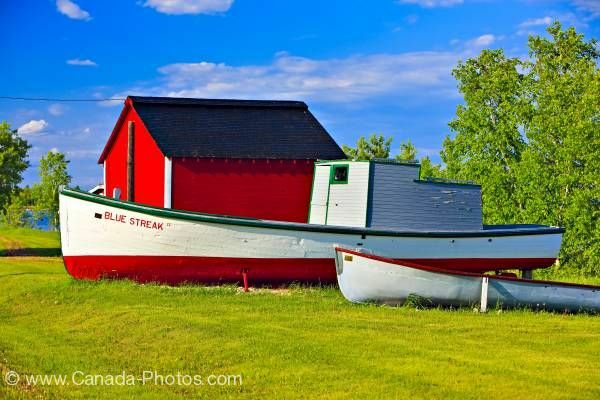 Photo of two old wooden fishing boats and a bright red shed in Hecla Village on the shores of Lake Winnipeg, Hecla Island, Manitoba, Canada. Along the shores of the beautiful Lake Winnipeg is the Hecla Village. A bright sunny day shows the green lawn with two old boats sitting near a red shed. The shed is painted a bright red with a black roof. One of the boats is painted white trimmed in red and green has its name the Blue Streak on its bow. Old boats and red shed in Hecla Village on the shores of Lake Winnipeg, Hecla Island, Manitoba, Canada.